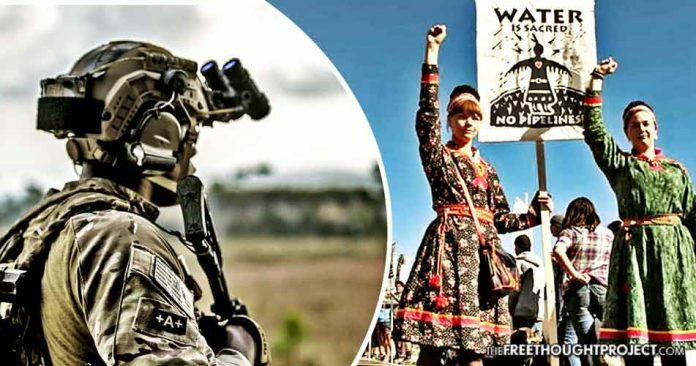 Indigenous water protectors and their non-Native American allies — who camped in North Dakota in close proximity to the Missouri River to oppose construction of the disputatious Dakota Access Pipeline — were likened to violent jihadist fighters by dubious mercenary international security firm, TigerSwan. Obtained by The Intercept, internal TigerSwan communications “describe the movement as ‘an ideologically driven insurgency with a strong religious component’ and compare the anti-pipeline water protectors to jihadist fighters,” that outlet reports. Worse, TigerSwan repeatedly described water protectors as “terrorists” — yes, literally. Members of the Standing Rock Sioux and Cheyenne River Sioux Tribes engendered the support of thousands of Indigenous Peoples and their supporters in encampments near Cannon Ball in an heroic effort to thwart Energy Transfer Partners’ Bakken pipeline project — but, for their prayerful, peaceful, and largely nonviolent actions to be equated with violent militants is, well, inexplicable. According to the Intercept, a TigerSwan employee leaked more than 100 internal documents proving the firm led a multi-fronted campaign of pernicious surveillance of activists and water protectors. Over 1,000 documents given the outlet upon public records requests affirm in detail the colossal surveillance program. Between September 2016 and May 2017, TigerSwan regularly fed ETP ‘situation reports’ containing comprehensive updates by operatives in North Dakota, South Dakota, Iowa, Illinois, and Texas, including surveillance of activists and their planned protests — as well as detailed notes culled from social media. Documents “also provide extensive evidence of aerial surveillance and radio eavesdropping, as well as infiltration of camps and activist circles,” the Intercept notes. Water protectors and independent journalists indeed recounted extensive surveillance and communications breaches while in Standing Rock camps and at the Tribe’s Prairie Knights Casino — especially pertaining to social media and two-way radios — so much so, newcomers to the area were immediately warned they would be watched. Beyond the internal TigerSwan communiqués, documents evincing coordination and shared intelligence between the FBI, Department of Homeland Security, the U.S. Justice Department, the Marshals Service, the Bureau of Indian Affairs, and a veritable cadre of state and local police — collectively deeming itself the “Intel Group” — reveal the real-time monitoring of the #NoDAPL movement on social media. Names of ‘dozens’ of “well-known activists” — and even those thinly associated with opposition to Dakota Access — appear in the documents. Reports shared by TigerSwan with the lengthy list of agencies read more like a comprehensive, collective, psychological evaluation — parsing out information such as the dynamics in the various camps, morale, infighting, and speculation on whether or not planned actions would be illegal or violent, including the potentiality weapons would come into play. “TigerSwan’s internal files describe its utilization of aerial surveillance, including use of helicopters and drones to photograph and monitor the pipeline opponents. The September 12 situation report notes that an operation by construction workers was ‘over-watched by a predator on loan to the JEJOC from Oklahoma.’ The TigerSwan contractor who provided the Intercept with the situation reports said he did not believe the company ever operated a predator drone, but metadata in images he shared pointed to a camera used by a commercially available Phantom 4 drone. One of the daily intelligence updates notes plans to obtain night-vision goggles, LRADs, body armor, and FLIR (forward looking infrared) cameras. Unapologetically, if farcically, militaristic language in the communications from TigerSwan paint the peaceful water protector movement as a finely-oiled machine on par with counterterrorism operations undertaken by nation-states — a tactic telling of brazen hostility by the firm toward activists whose sole concern continues to comprise protection of the water supply from contamination with noxious fossil fuels. While the Intercept report goes into far greater detail on these phenomenally revealing communications, the fact TigerSwan — and, thus, the law enforcement and intelligence agencies making use of its reports — literally characterized water protectors as “terrorists” should not be blithely ignored. Protest is and inarguably must remain a constitutionally-protected activity — period. When myriad insidious government agencies partner with a firm known for shady, violent, and potentially illegal actions confronts a movement dedicated solely to nonviolent, prayerful actions, the ability to redress grievances through demonstration stands directly threatened. Whatever your particular position on the Dakota Access Pipeline — and the fossil fuel industry, in general — to qualify activists as terrorists prognosticates the coming end to protest and resistance in the U.S. This war on dissent, in all its fetid ugliness, leads only to resounding totalitarian rule; thus — if you value the shreds of freedom and liberty still clinging to existence in the United States — resentment toward the #NoDAPL movement and other protesters must, instead, be turned toward the arrogant rulers convinced The People are Enemy Number One.